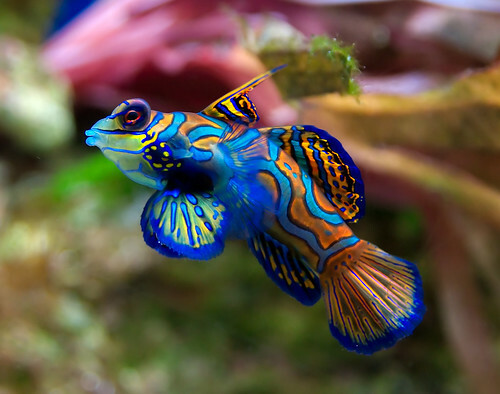 Synchiropus splendidus, aka Mandarinfish or Dragonet, are a small species of dragonet which is native to the south Pacific. 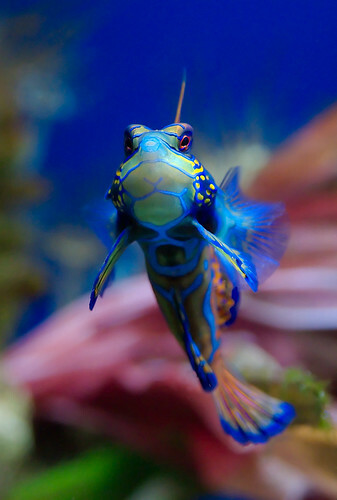 These fish are commonly, but incorrectly, referred to as Gobys due to their resemblance. This fish is reef safe grows to only about 5 cm / 2 inches so is perfect for the smaller aquaria, but be ware as it may eat very small crustaceans. Another new fish for you all today: Histiophryne psychedelica (Theodore Pietsch, Rachel Arnold, and David Hall, 2009), aka "Psychedelic" fish, was discovered in January last year and is a relative of the Anglerfish. This fish originates form the shallow waters around Ambon and Bali (Indonesia) and moves in much the same way that a Frogfish does, i.e. by sticking to the rocks and using it's "arms" to walk as well as by floating on the current with the aid of their webbed "hands" and their ability to expel water from small gill openings which are located around their "elbows". But the oddest thing about the fish is that it has a flat face with forward facing eyes, much like humans do, which is very unusual in fish. 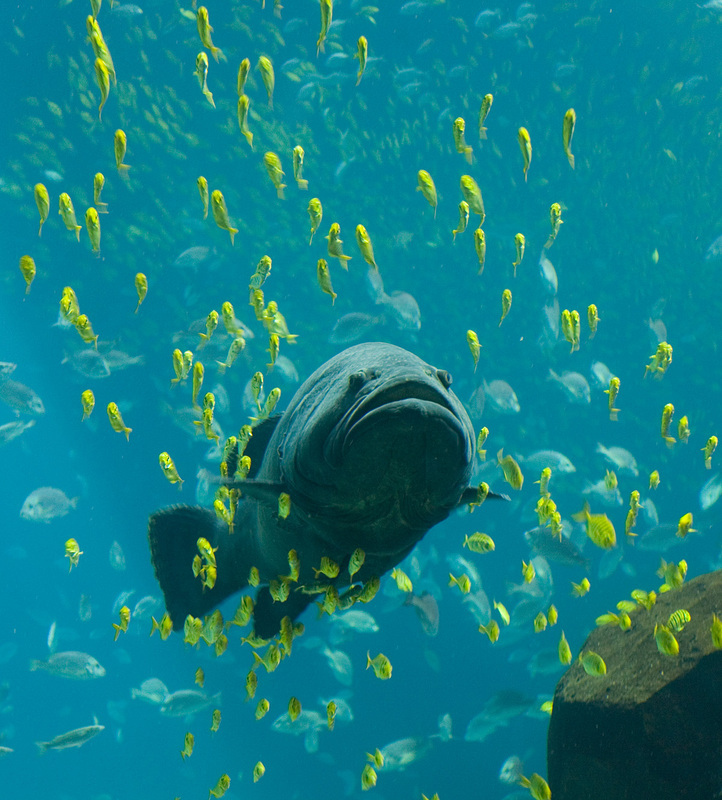 The giant grouper, also known as the brindle bass , brown spotted cod , bumblebee grouper and as the Queensland groper in Australia, is the largest bony fish found in coral reefs, and the aquatic emblem of Queensland, Australia. It is found throughout the Indo-Pacific region, with the exception of the Persian Gulf. The species can grow as large as 2.7 meters (9 ft) long, weighing up to 600 kg (1320 lb); there are unconfirmed reports of it growing much bigger. They are fairly common in shallow waters and feed on a variety of marine life, including small sharks and juvenile sea turtles. This giant fish is similar to an Estuary Cod and colour changes with age. The giant grouper has a large mouth and a rounded tail. 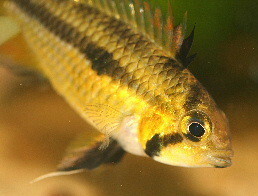 Juveniles have irregular black and yellow markings, while adults are green-grey to grey-brown with faint mottling. There are numerous small black spots on the fins. 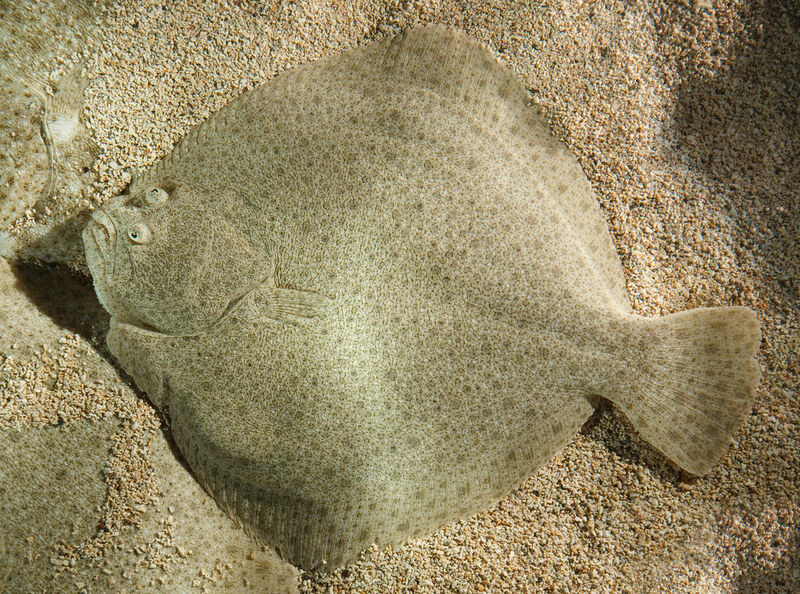 The European Turbot (Psetta maxima) is a large left-eyed flatfish found primarily close to shore in sandy shallow waters throughout the Mediterranean, the Baltic Sea, the Black Sea and the North Atlantic. 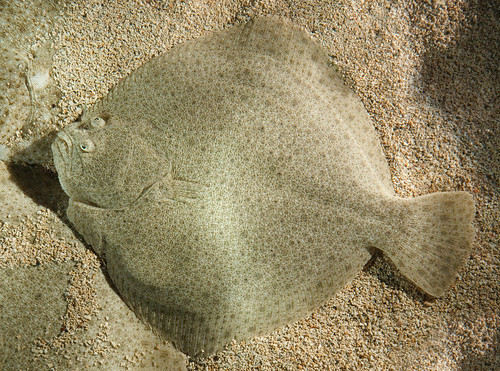 The European Turbot has an asymmetrical disk-shaped body, and may attain sizes of 30 to 40 pounds (approx. 15 to 17 kilograms). It is highly prized as a food fish for its delicate flavour and is a valuable commercial species, acquired through aquaculture and trawling. Turbot are farmed in France, Spain, Turkey, Chile, Norway and China. The photo above is of an Acanthodoris lutea in a California tide pool laying eggs: the doris is facing away from the camera, with the white "skirt" being the eggs. The orange-peel doris is a species of nudibranch or sea slug, a shell-less marine opisthobranch gastropod mollusk in the family Onchidorididae. This species is the largest of the northeastern Pacific acanthodorids. It is a common species, and it is very noticeable because of its bright coloration, which is aposematic. The species name "lutea" is a Latin word which means an orange-yellow color. As for the generic name, "acantho" comes from the Greek word meaning spiny, and "doris" is the name of an ancient Greek sea nymph. This nudibranch grows to about 30 mm in length. It has a bright orange papillated dorsum covered with yellow specks. 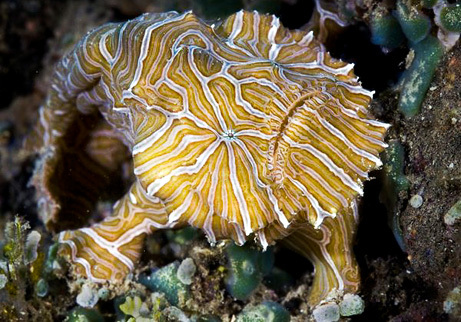 As is the case with many nudibranchs, this bright coloration is thought to be a reminder to would-be predators of its distasteful nature, an example of aposematic coloration. This species is aposomatically colored, warning predators of this toxic deterrent. If you handle this dorid you will smell the deterrent chemical on your fingers: it has the pungent aroma of sandalwood. 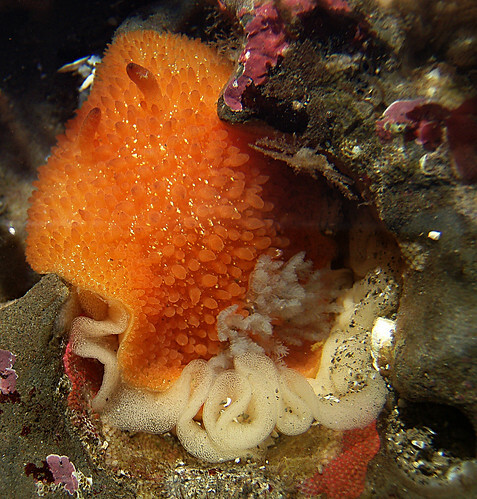 The orange-peel doris lives in the intertidal and subtidal zones on rocky shores, feeding on encrusting bryozoans. It turns the chemicals received from the bryozoan food into a noxious metabolite which is toxic to possible predators (Morris et al. 1980). 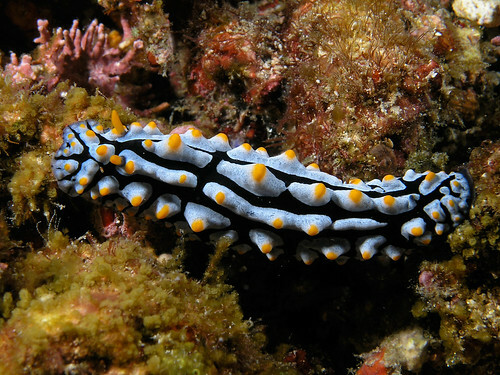 Phyllidia varicosa is a species of sea slug, a dorid nudibranch, a shell-less marine gastropod mollusk in the family Phyllidiidae. This species is widely distributed throughout the Indo-West Pacific Oceans including the central Pacific and the Red Sea. Those are some absolutely gorgeous pictures. I wouldn't mind a sea slug if it looked like that. Last edited by fnsr on 2011-04-11 14:35, edited 1 time in total. Dardanus calidus (Coenobitidae), large red hermit crab, with Calliactis parasitica (Hormathiidae), hermit anemone. 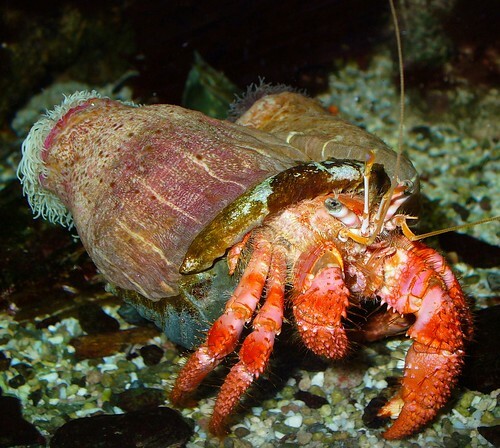 The crab will attach anemones to its shell to protect itself from attacks. 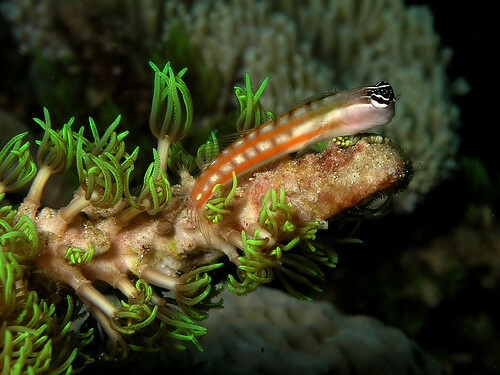 Ecsenius axelrodi, known commonly as the Axelrod's clown blenny or the Axelrod's combtooth blenny, is a species of combtooth blenny found in coral reefs in the western central Pacific ocean. which is very unusual in fish.